For 14 years, Spaceflight Now has been providing unrivaled coverage of U.S. space launches. Comprehensive reports and voluminous amounts of video are available in our archives. Sign up for our NewsAlert service and have the latest space news e-mailed direct to your desktop. After a string of technical and weather-related delays, SpaceX engineers in Cape Canaveral are targeting liftoff of a Falcon 9 rocket Monday with six machine-to-machine Orbcomm communications satellites designed to refresh the company's data relay network in low Earth orbit. The satellites will help Orbcomm clients track ships, trucks, cargo containers, remote oil and gas infrastructure, weather buoys, research stations and other assets. 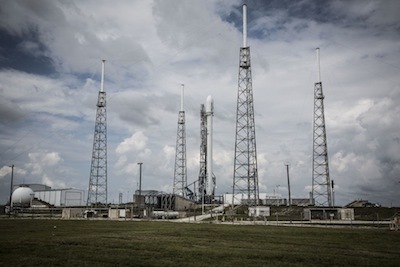 Liftoff is set for 9:21 a.m. EDT (1321 GMT) from Cape Canaveral's Complex 40 launch pad. The launch window extends to 11:54 a.m. EDT (1554 GMT). SpaceX completed a customary prelaunch engine firing on the launch pad Friday, igniting the Falcon 9 rocket's nine Merlin 1D first stage engines for about three seconds. The 22-story rocket was held down on the launch pad during the test, which occurred at the end of a practice countdown that included fueling of the launcher with rocket-grade kerosene fuel, liquid oxygen and helium pressurant. The engines collectively produce up to 1.3 million pounds of thrust and fire for nearly three minutes during launch. Officials will review data from the static engine firing before clearing the Falcon 9 rocket for liftoff. The launch was scheduled for May, but SpaceX encountered a helium leak during a preflight test, triggering a month-long delay. Concerns with one of the Orbcomm satellites kept the mission grounded for an extra few days before SpaceX mounted its first launch attempt June 20. The launch team aborted the June 20 countdown after detecting an unexpected drop in pressure in one the rocket's second stage propellant tanks. A source told Spaceflight Now the problem was traced to a valve in a liquid oxygen tank. Another launch attempt June 21 was thwarted by lightning at Cape Canaveral, and SpaceX called off a planned liftoff June 22 to evaluate a steering actuator on the rocket's second stage engine. SpaceX rescheduled the launch for July 14 to give ground crews time to resolve the issues that prevented liftoff in June. The slip to mid-July also allowed the U.S. Air Force to complete previously scheduled maintenance activities on the Eastern Range, which provides safety, tracking and communications services for all launches from Cape Canaveral. The Orbcomm satellites will be released from a mounting ring, supplied by Moog Inc., atop the Falcon 9 rocket's second stage in a choreographed 20-minute sequence once the launcher's 10 Merlin engines finish their propulsive work. The first of the six Orbcomm OG2 satellites, built by Sierra Nevada Corp., will deploy nearly 15 minutes after liftoff. The spacecraft are programmed to release at preset times until the final satellite flies off the rocket about 35 minutes into the flight. The first opportunity to communicate with the spacecraft comes about an hour-and-a-half after launch during a pass over California, officials said. The satellites will also extend their power-generating solar panels and communications antennas. Monday's flight is the first act in a two-launch, 17-satellite deployment by SpaceX and Orbcomm this year. Orbcomm officials say the company's investment in the second-generation satellite fleet, which replaces the company's aging spacecraft already in orbit, is worth approximately $230 million. A technicians works on an Orbcomm OG2 satellite at its factory in Louisville, Colo. Credit: Sierra Nevada Corp.
About $70 million in assets are aboard Friday's launch, according to Robert Constantini, Orbcomm's chief financial officer. Orbcomm is paying SpaceX $42.6 million for the two launches, a discount from the approximately $60 million per launch price advertised on SpaceX's website. Most of Orbcomm's existing first-generation, or OG1, satellites were launched more than 15 years ago. They have operated years longer than designed, officials said. The satellites offer two-way data links to help customers remotely track, monitor and control transportation and logistics assets, heavy equipment, oil and gas infrastructure, ships and buoys, and government-owned equipment, according to Orbcomm's website. Founded by Orbital Sciences Corp. in 1993, Orbcomm Inc. was spun off as an independent company in 2001. Marc Eisenberg, CEO of Orbcomm, said being so close to launch is a "pretty amazing feeling, considering we started financing the constellation in 2005." Orbcomm's 889,000 subscribers will rapidly see benefits from the launch, including reductions in the time it takes to transfer messages. Full exploitation of the OG2 system's upgrades, such as 24-hour near real-time service, larger message capacities, and greater geographic coverage, will come after Orbcomm's next 11 satellites launch later this year. "A good way to look at it is six satellites give you OG2 coverage about 8 hours a day," Eisenberg said. "And then the other 16 hours a day, you've got OG1 coverage." Orbcomm decided to put six satellites on its first launch with SpaceX for a few reasons, according to Eisenburg. Six satellites will sufficiently fill Orbcomm's coverage gaps, and it allows ground controllers more time to focus on each spacecraft during post-launch commissioning. "Our No. 1 goal is to fulfill the mission objective, and the mission objective is to fill the hole in the sky and bring the average message down significantly," Eisenberg said in an interview. "You need a minimum of five to fulfill the mission objective. You want to go a little more than give because you want to take one of those spacecraft and start drifting it to get a feel for how that works." It also eases insurance worries, Eisenberg said. Insurance companies charged a higher rate for the first launch than the second flight, when officials expect the risk of of a launch or spacecraft failure will be mitigated by the experience with the first mission. 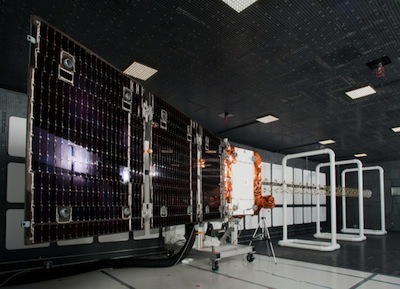 The first Orbcomm OG2 satellite was lost on a SpaceX Falcon 9 launch in October 2012, which suffered a first stage engine failure and burned more propellant than planned to make up for the mishap. The 2012 launch achieved its primary purpose of delivering SpaceX's Dragon supply ship to the International Space Station, but there was not enough fuel to put the Orbcomm secondary payload in the correct orbit. The rocket released the spacecraft in a lower-than-planned orbit, but officials said engineers were able to unfurl the satellite's solar panel and antenna, demonstrating two of the craft's riskiest post-launch milestones. The satellite burned up in Earth's atmosphere after three days in orbit. Although it was not a factor in the decision, launching just six of the oven-sized satellites on the Falcon 9 rocket also gives SpaceX plenty of margin to try to recover the booster's first stage in the Atlantic Ocean a few hundred miles northeast of Cape Canaveral. The Falcon 9's first stage, fitted with four carbon fiber and aluminum honeycomb landing legs, will reignite its engines after completing its job to boost the Orbcomm satellites into space. While the launcher's second stage continues firing to put the satellites in orbit, the first stage will autonomously fly itself back to Earth, reducing its velocity before falling into the sea. Recovery crews stationed near the landing zone will attempt to retrieve the stage intact. SpaceX wants to eventually fly its rocket boosters back to the launch site for reuse. The first stage from the Falcon 9's previous launch in April splashed down in the Atlantic as designed, but rough seas prevented crews from getting to the rocket before it was destroyed by waves. "This time, we're going to have much more capable boats," Elon Musk, SpaceX's founder and CEO, told reporters in April. "We kind of got unlucky in that we landed the stage in the middle of a storm. It will also be landing in the water much closer to land than last time, so I think hopefully we'll avoid some of the deep ocean stuff." 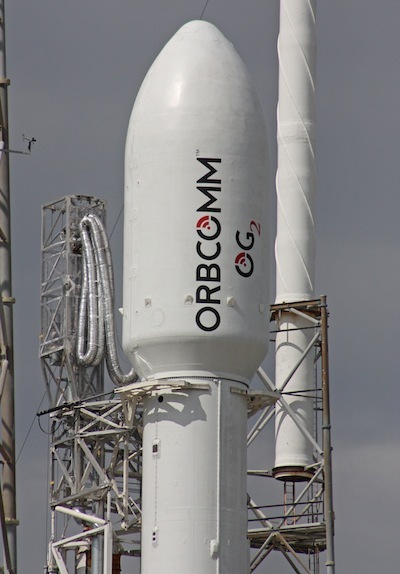 The second-generation, or OG2, spacecraft will join the Orbcomm's 25 operating first-generation satellites and two ship-tracking satellites used by the company, according to Eisenberg. Each second-generation satellite has six times the data capacity and twice the transmission rate of one of Orbcomm's existing satellites. A higher-power communications system on the OG2 satellites will allow customers on the ground to connect with smaller, less-expensive antennas, officials said. "One satellite is going to make a big difference," Eisenberg said. "For Orbcomm to continue to be successful ... we need to launch some satellites," Eisenberg told investment analysts in a May conference call. Orbcomm's satellite fleet flies in groups arranged in four orbital planes to provide global coverage. One of the orbital planes is almost vacant, Eisenberg said, and five of the six spacecraft aboard Friday's flight are destined to occupy that plane. "There is a specific hole in the sky that we're going to fill, which is why it's going to be material to the service that we offer today," Eisenberg said. "We've been waiting to plug it for a long time. There are going to be a lot of excited customers." At least one of the six spacecraft will drift into another grouping of Orbcomm satellites, he said. Each spacecraft has a launch mass of 170 kilograms, or about 375 pounds. They are designed to function for at least 10 years. Sierra Nevada engineers will spend the first month after launch testing systems on the satellites, which use a new spacecraft bus. Sierra Nevada will turn over control of the satellites to Orbcomm 30 days after launch if there are no significant problems, allowing the company to begin testing of the communications payload manufactured by Boeing Co.
Eisenberg expects a quick impact to Orbcomm's bottom line. "Once they turn it over to us, we can test the network part of it and start communicating with the satellite through the Boeing portion," Eisenberg said. "They're all going to be jumping in and out of service, so they'll start have an affect at that point."